It's been a while since I last wrote a crafting blog entry. I've been busy with the other love in life Basketball. Some of you might know that I will be a NTO (National Technical Official) at the Paralympics. I am extremely honoured and excited to be doing this. Today is the opening ceremony of the Olympics and I am really excited for my peers who will be attending in my home town of London. I have had the privilege to officiate at a number of tournaments over the last few years, one of the biggest being the World Wheelchair Championships 2010 in Birmingham. 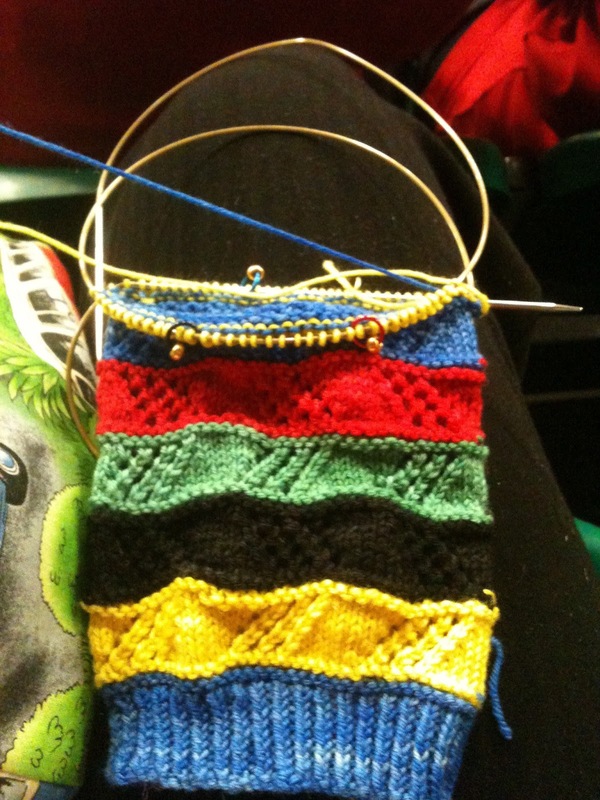 I got to meet lots of great people from all over the world and I also started knitting again. So in between my games I would be knitting, I would get a few strange looks but it kept my hands busy so my nerves were kept at bay. 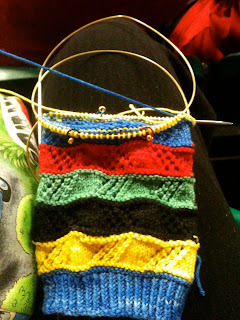 Fast forward to 2012 and I have been planning what to knit over the Olympics and Paralympics. I have decided to knit socks and a shawl as well work on my long-term sock yarn blanket project. I have called on friends to help me choose what patterns and yarn to knit. The socks I am knitting are called Mixalot by a fabulous designer called Rachel and the yarn is from The Knitting Goddess. The shawl I am knitting is Meandering Vines, this pattern is the same pattern I knitted two years ago at the worlds. The socks have been started. I am so excited about my involvement in the Paralympics and watching the Oylmpics that I could burst. I am fully aware sport is not everyone's cup of tea but these events should be seen as positive things.